Zucchini marinara, as all of you know, is a staple in my home. 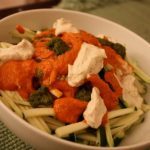 It’s a simple recipe: zucchini ribbons, mixed with fresh raw marinara sauce, chunks of creamy avocado, and fresh herbs. I keep raw marinara in my freezer at all times, which makes it easy for me to prepare this simple bowl at a moment’s notice. 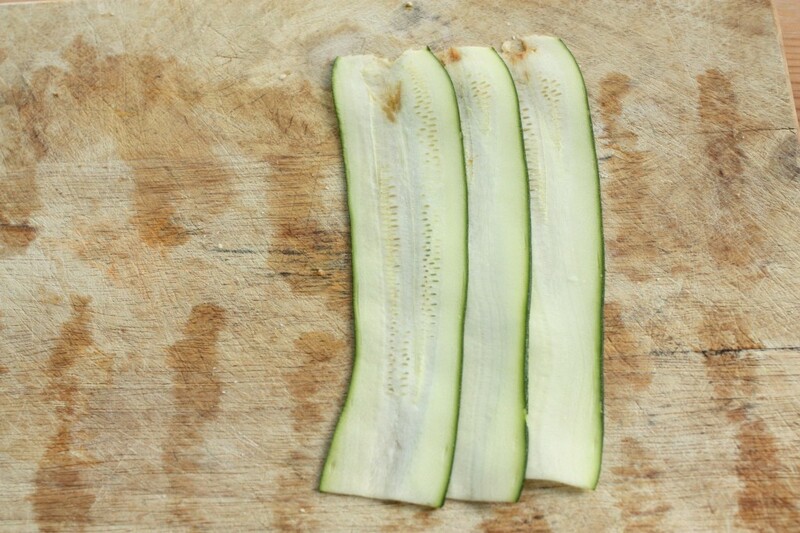 Lately, I’ve been trying to give a little more attention to other forms of raw “pasta.” Next week, I’ll be sharing a new recipe with zucchini tagliatelle, and today I’m here with a little how-to for zucchini manicotti. This dish looks incredibly beautiful, but if you prepare your cashew cheese and marinara ahead of time, it’s actually one of the easiest raw centerpiece dishes you can make. 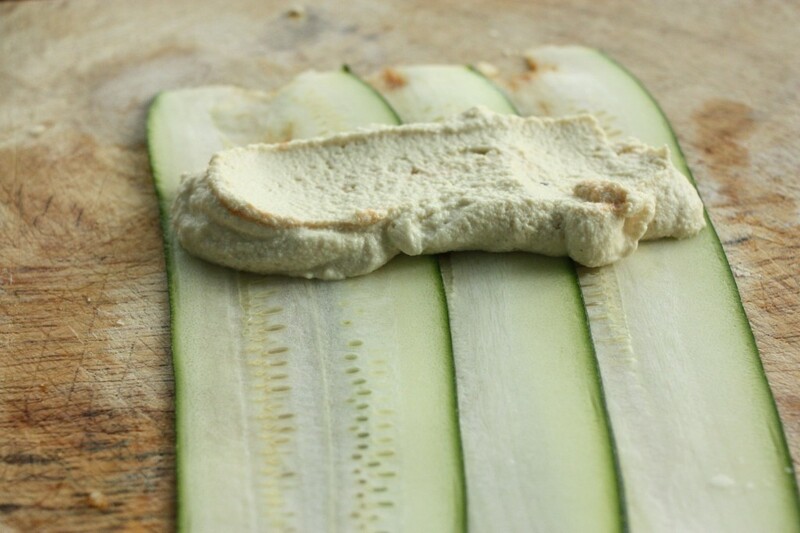 Place about 2-3 tablespoons of basic cashew cheese (recipe below) toward one end of the strips. Roll up, starting from the side closest to the cashew cheese. 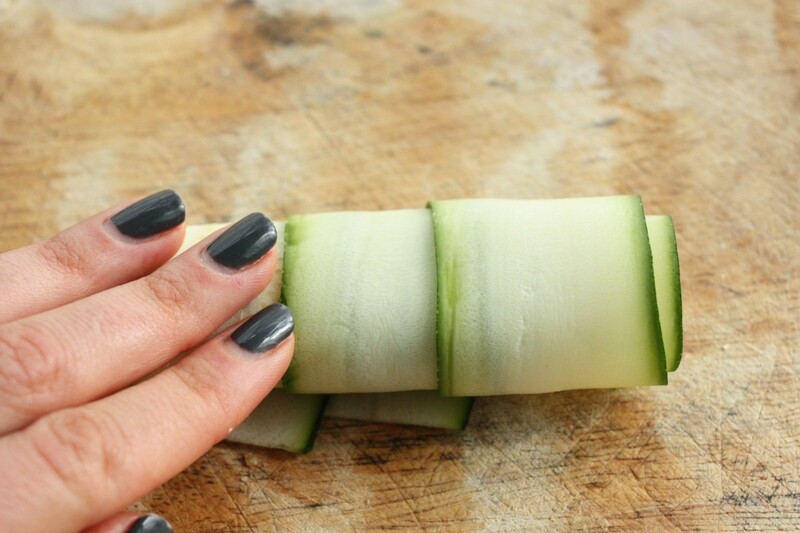 Tuck the loose ends on the bottom of your manicotti roll underneath it. 1. 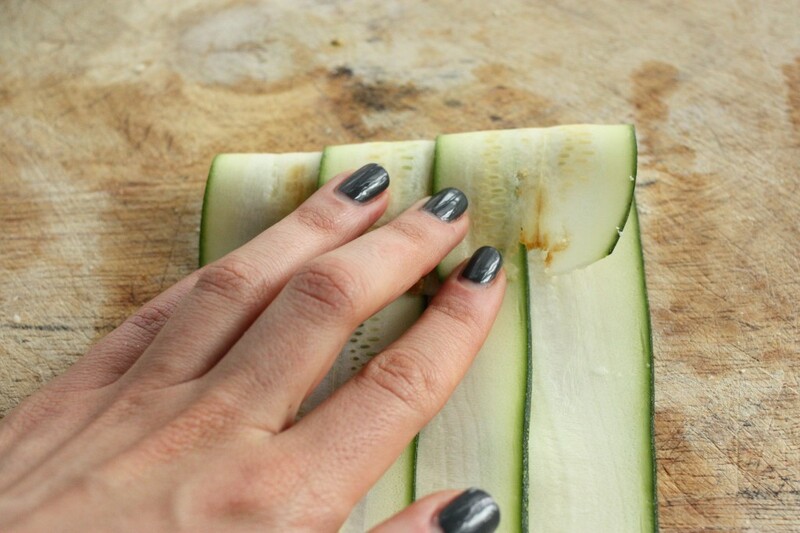 To make the pasta, slice zucchini into long, flat, and thin strips using a vegetable peeler or mandolin (see instructions in this post). 2. Place the cashews, lemon juice, and nutritional yeast in a food processor fitted with the S blade. Pulse a few times. Turn the motor on and drizzle in water until you have a very smooth, but still thick and spreadable texture (about ⅓-1/2 cup of water). It should take a full minute or two. Stop a few times to scrape the bowl down as you go. Season to taste with salt and pepper. 3. Blend the pepper, tomatoes, sundried tomatoes, olive oil, salt, thyme, oregano, basil, and dates in a high speed blender till thick and smooth. 4. Follow the instructions above to assemble the manicotti. Top each roll raw marinara. Sprinkle with basil, if desired, and serve. You can flavor the cashew cheese you use with sundried tomatoes, herbs, or spices to change the flavor of the manicotti. Pesto or cashew cream will also make very good toppings! This dish certainly turns out best when you use seasonal ingredients. If you’re still enjoying fresh tomatoes or zucchini where you are, now’s the time to make it! But I must confess that I like the dish so much I’ve made it through all seasons. It makes an elegant appetizer for entertaining, or a lovely centerpiece, so long as you serve it with a bountiful salad, legumes, roast veggies, or other delicious accompaniments of your choosing. Don’t feel bad. I’m not a fan of raw broccoli either, unless it’s *completely* drenched in some delicious, high-fat dressing. If I could have any culinary-inspired wish granted, it would be to have a year round garden of tomatoes, zucchini, & basil. 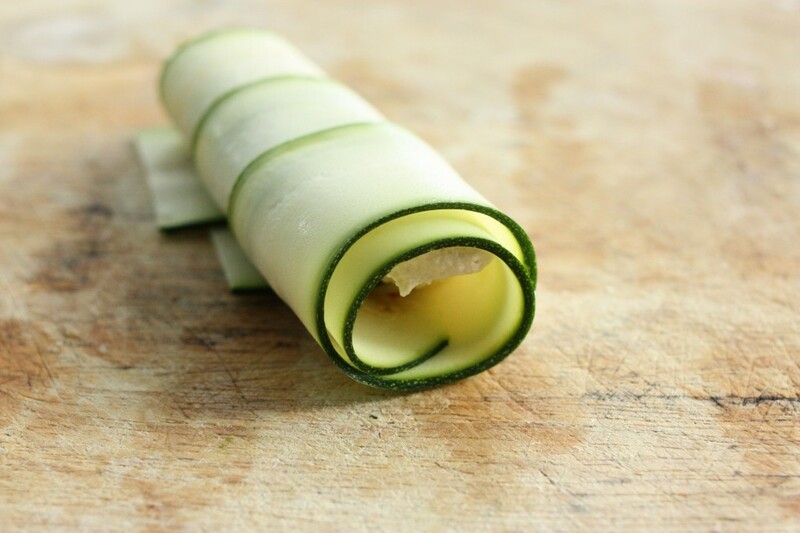 So many ways to use zucchini, it’s the wonder veggie. 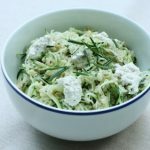 I’ve never tried any other raw pasta other than the noodle kind, but this seems so simple, I wonder why I haven’t tried it before. And you’re right, so lovely! Well, this photo caught me with fresh nails 😉 With all the food prep I do, mine chip right away, too! I wish the same, re: summer veggies. Do your warm, Texas temperatures enable such a thing to come true? Guess what else is pretty? 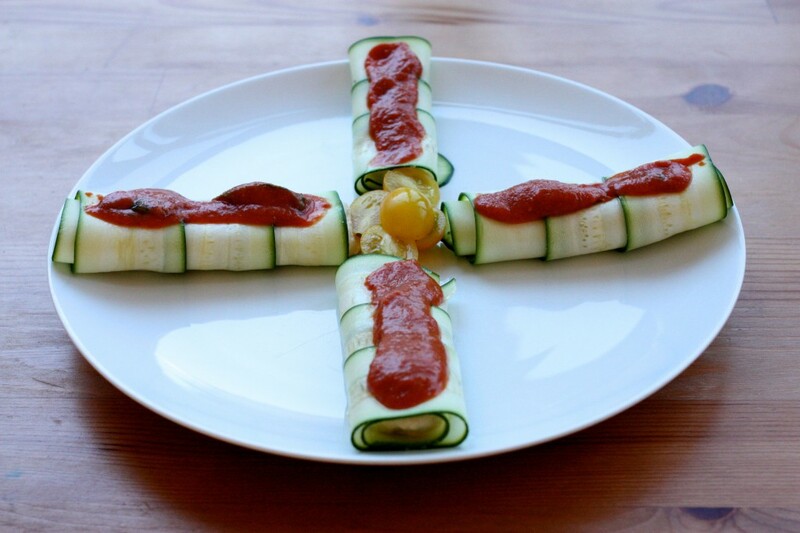 Beautifully done…it would be fun to alternate them with yellow zucchini manicotti too! Thanks for the recipe! 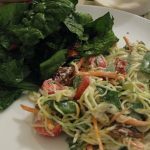 You have proved once again that raw food preparation does not have to be time-consuming! 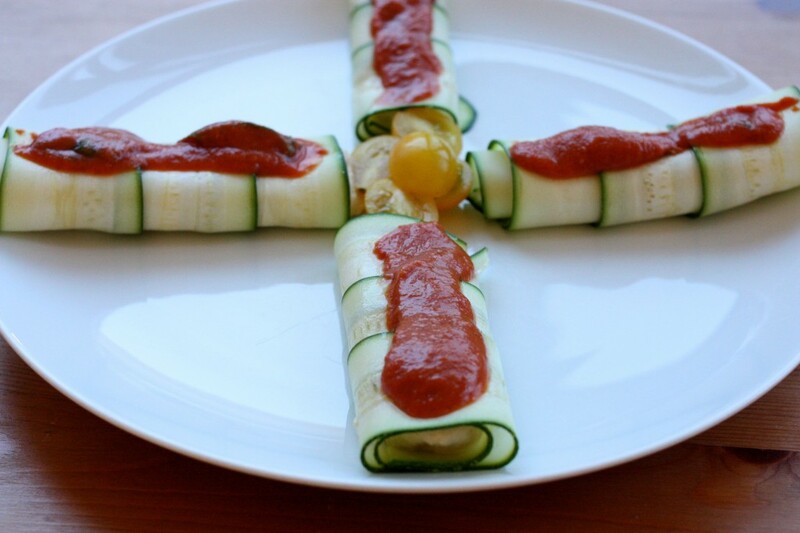 This looks much prettier and easier to make than traditional manicotti. I will definitely try this soon as it is still hovering at about 80 degrees where I live! Beautiful, better version of the traditional Italian pasta dish. Yum! 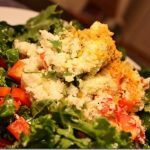 This is almost exactly the same as a recipe I created when I was studying at Living Light! It was a big hit with the group. 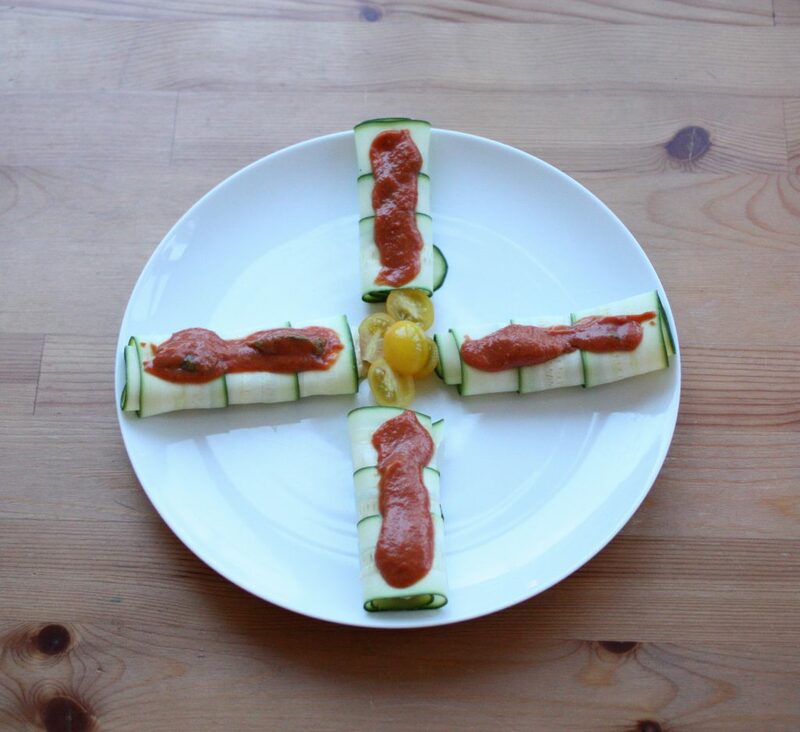 Much more interesting than regular raw zucchini marinara. So pretty! And I love your black nails, thinking of getting me some black polish too! How pretty it looks and love the ingredients! Mmhmm thank you for your never ending inspiration. Many hugs from Sweden! They look really good and I love the idea of keeping your marinara in the freezer to have on hand at all times. Always looking for time saving ideas. I had this exact dish, it seems, at Vegehop in Zagreb over the summer and have been craving it ever since. So easy to make, I don’t know why I haven’t yet. But I will be making yours! 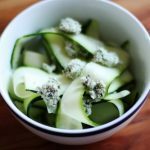 Oooh, I love raw zucchini noodles! Do you know how many calories this recipe has per serving?